This may sound heretical coming from a personal business coach. Take your own advice. My coaching clients share a common desire. They want to improve, so that they can move to the next “higher” level of their career or life. They are frustrated enough, or wise enough, to seek the counsel of another. Our goals center around identifying and changing behaviors that lead to outcomes we agree are desirable. Agreement is more essential than the goal. I have learned that the hard way. One of the most powerful tools I use is to ask the person to address an issue from their desired outcome’s perspective: The If/Then approach. ” If you were president/customer/competitor what would you do/recommend/advise?” What always surfaces is an answer that already existed in the mind of the person. Usually individuals seeking coaching have seen the path and, for whatever reason, found it difficult to stay on. Coaching is best when the student discovers they had the answer all along. Call it coaching as sculpture. 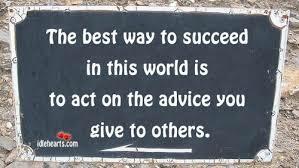 Knowing that makes my confession more embarrassing: I have a hard time taking my own advice. I am constantly amazed how easy offering others advice on how best to move forward comes to me, yet how easy it for me to apply the same advice to myself. I facilitate a course on how to get a “stuck” small business to their next level. Love the opportunity and receive very positive feedback. Ironically, I seem perfectly content to not move my coaching business to the next level. I know what to do and continually find ways to avoid/sidestep/excuse the actions I need to take to achieve that next level of growth. Jim Collins in his classic book, Good To Great, suggests leaders always Confront the Brutal Reality. This blog is my taking Jim’s advice. Brian Tracy suggested years ago that writing anything down increases the likelihood of success by 200%. So my next step will be to write down my goals, write down my challenges, write down whose help I need, and then craft a series of actions steps I need to do each week to achieve my goal. And finally, I need to share these goals with my accountability partner (my unpaid coach:) ). Are you a linebacker or a balloonist? This question came to me listening to an audiobook while watching conference championship football. The book, The One Thing by Gary Keller, founder of Keller-Williams Real Estate, suggested that you need to blow up you current approach before you can be ready to move on to the one thing that will take you to the next level. As I am listening to this, I watch Rashaad Evans blow up the Florida running back at the goal line. 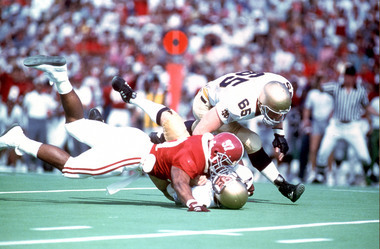 In typical football speak the announcer says, “Evans really blew up that play and now Florida has to go for it on fourth down.” That’s when my thoughts and plans collided as well. Keller suggests blowing up the habits and thinking that keep you from pursuing your dreams. And dreams take you to new heights. Balloons are something that you also have to blow up, and when you release them, they soar away to heights beyond where you can see. Furthermore, if you have taken a balloon ride, you know the wonderful sensation of soaring quietly at a height you have never known. Your perspective of your surrounding will be changed forever. Keller’s goal is to show everyone how to live a life beyond what they currently see. He is a balloonist for your possibility. Most of us, and especially me, set our sights on just what we can see and fear imagining what life could be if we took our dreams on a balloon ride. Of course the answer to my opening question is both. Before soaring, you must jettison some small thinking and heavy “waste of time” habits. That requires that linebacker mentality. Yet once the self-inflicted limitations are blown up, you can blow up your possibility balloon and really soar. And once you have that new view, going back to the old view just doesn’t cut it. My goal this year is to BLOW UP TO GO UP. And I will start by dropping to my knees and asking my Master Linebacker to help me blow up my bad habits. Every balloon needs a name and pilot. Jesus is the Pilot of Isaiah 40:31. 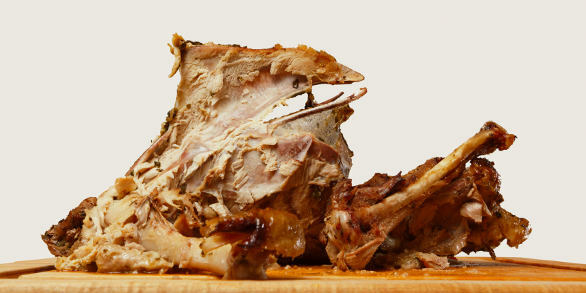 Thanksgiving means family around the table, too much football, and too much food. We count the blessings of family and listen to stories of what has happened this during the year for which we should be thankful. An old friend of mine has given me pause to think about his situation this year. He suffered a stroke this year which severely impacted his 12 hour day work routine in a business he has run since college. He has three kids and his oldest has taken over running the company. His other two kids are not involved in the business and the business is his primary asset. I heard that he has gone back to smoking, and that has me concerned on several levels. If another stroke totally incapacitates him, or worse, I wonder about his plan is for business and his kids? One of the toughest concepts to deal with in business exit planning is transferring ownership to family members. Next generation transfers account for 20% of all sales (1). Unfortunately, leadership and business acumen are not part of the DNA code. And the next generation rarely has the capital to pay upfront like a third-party buyer. In addition, almost all of them raise the question of fairness with the non-participating heirs. Coordinating tax minimization strategies, like Lowest Defensible Valuations ,for insider sales with estate planning considerations and even business continuity issues, like a stroke, requires a team approach; hence the need for exit planner quarterbacking. How do I know this? I can’t count the number of conversations with friends that turn to the inequity of family estate distributions. Seems someone always feels that another sibling got more than the other one. When control of the “family” business is involved, the risk increases. According to the Family Business Institute, only 30% make it past the second generation, and less than 15% of businesses make it past the third generation. This is one of the reasons many Thanksgiving conversation are filled with avoidance routines and early exits. Perhaps you’ve had one of the “conversations after the conversation” in the car on the way home. So I hope my buddy has done some good planning with his CPA, financial planner, insurance agent, and his attorney. I pray that they all talked to each other to make sure their individual advice was coordinated. Most importantly, I will continue to pray for and encourage him to quit smoking. 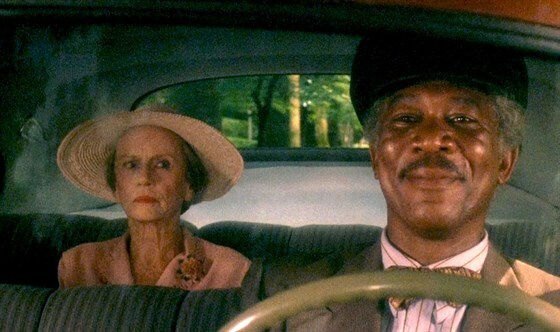 Driving Miss Daisy is a wonderful movie with Hoke (Morgan Freeman) changing from a chauffeur for Miss Daisy (Jessica Tandy) to a lifetime friend and companion. Most entrepreneurs/business owners remind me of Hoke; they drive their business into creation, growth, and profitability. When it comes time to plan their exit, most business owners have a hard time becoming Miss Daisy. They need to turn over the wheel and have a hard time not doing just what is needed to achieve their nest egg goals. In Exit Planning: The Definitive Guide, John Brown, CEO of BEI, points out the value of becoming Miss Daisy. In 30 years of helping business owners develop exit plans, Brown has identified the number one value driver most sophisticated buyers look for: Next Level Management. Without it, the value a seller seeks is discounted heavily, or no offer is even made. Next level management refers to managers that have “been there, done that.” They have the ability to drive value to the next level of performance. They are expensive and a bargain at the same time. They cost more than the owner is used to paying, but when they improve cash flow often 100-1000% over 5 years, they more than pay for themselves. More importantly, they have the ability to raise the cash flow based purchase multiple as well. The key to giving up the wheel is realizing that you not only arrive sooner at your financial destination but you can also see a lot more from the back seat. Time for planning and strategic development becomes available. And you arrive more refreshed. So when you realize in your exit plan that you need to grow to the next level to retire with the financial security you deserve, think about Hoke and Miss Daisy. Giving up the wheel may be the best decision you ever make. Tonight I’m sitting here watching Jo decorate another house that she and her husband, Chip, have “fixed up”. On other nights I come home to Love It or List It with Hillary and David or Property Brothers with Drew and Jonathan because my wife loves HGTV. I have come to realize that a new addition to my business is a fusion of my wife’s favorite HGTV shows. In part of my consulting practice, I serve clients as a “business” stager. I work with properties that have a lot of potential but for some reason need some cleaning up, remodeling, and staging. My goal is true Love It or List It: To make a business so nice that the owner no longer wants to sell it. Some businesses just need a little touch up, a new P&L, some operational clean up and removal of too many lifestyle expenses. Some businesses need major renovation, a new product line, personnel changes, and/or marketing focus. And like all the shows, no business exit plan unfolds like you expect. Asking owners to trust you to improve something they view as their baby is always more difficult than the initial agreement. The irony is that usually the result of helping someone stage his business for sale is the kindling of a new love affair with the business. The owner ends up loving it more than wanting to list it. And of course, that is our goal. When you love what you have, the market offers buyers willing to pay a premium. We all want what we think isn’t for sale. Open it up to lean processes. Upgrade to current technology features. Set some goals that would make you a fool to sell your business. A new Fixer Upper episode is coming on. Time to learn a few new tricks! Arnold Palmer was part of my Dad’s big three. When I was a kid, on his desk at work were pictures of my mother, Bear Bryant, and Arnold, Arnie to us. The standing joke among us kids was, “Who do you think Dad looked at more?” Dad always loved Mom, but his affection for Alabama football and Arnie were a close second. We went to the Pensacola Open in the late fifties, and I got Arnie’s autograph. My best family memories seem to always include football and golf to this day. With that as a lead in, Mr. Palmer’s passing, revealed a wonderful trait about him. He considered being a “professional” golfer included making sure his signature was legible. He figured if a fan wanted HIS autograph, he owed it to them and his profession to make sure they got his best effort. Professional golfer after professional golfer related stories of Arnie admonishing them to make their signature legible. And for 60+ years, you could always tell an Arnold Palmer signature. Part of his greatness was his attention to his professional in the little things. My calling in business is working with people, and Arnold has me wondering. If I passed today, what would my colleagues say was my consistent application of being a professional? What would be my “signature”? I would hope it would be encouragement. That has been identified and ratified as a gift and talent I was born possessing. I would hope my colleagues could relate stories of my encouragement. Yet, I know that my encouragement at times is less than legible, and my willingness to stop for anyone needing it has been far below Arnold’s autograph commitment. Arnold Palmer, the man, is gone, and he leaves behind so many lessons for his followers. I think his picture needs to be added to my desk as a reminder to be a professional every day. Private Miller reporting for duty in your Army, Mr. Palmer! Entrepreneurs and small business owners have more hats than heads when they are growing and sometimes saving their companies. Given their “head on a swivel” world, what is the one metric they should always stay in touch with? Is it cash flow, market share, sales, or debt service coverage? My answer is simple, the lifetime value of a customer. Three key words combine to be the biggest rock in the jar of focus. And we all know that if you get the big rock in the jar, the pebbles and sand tend to fit in nicely. Lifetime – Would anyone like to compete on customer turnover? Only the scammers and spammers approach business this way. Lifetime recognizes the commitment we all want in our relationships. To think of your customer like your family changes the way you interact. Decisions become strategic first and tactical second. You don’t ditch your kid for a newer smarter one. You work to bring out the best in what you have while deciding whether to grow the family. Value – How many of us value our customers? I mean really value. Have you thought of all the volume that lifetime customer relationship has meant to you? Have you thought of how many dollars you have saved in searching for a replacement for their business? Have you valued how much word of mouth referral business a customer has brought you? I continue to do business with people that recognize my contribution and let me know it. I choose being valued over price nearly every time. Customer – Is anything more crucial to your survival in business than a customer? Is there anything worse than losing a customer? Anything more draining than a mad customer and anything more satisfying than meeting and surpassing a customer’s expectation? The heart of servant leadership is always focused on the customer and not the company. And the best part of this metric is the power it possesses. When you lengthen the lifetime value of a customer, revenues increase without increasing your costs. Marginal advertising and customer service tend to also go down. When customers feel valued, they become less price sensitive, and they help you avoid having to compete on price. Finally, when your lifetime value exceeds your competition’s lifetime value, your enterprise value grows exponentially given the increase in both cash flow and the EBITDA multiple. Who wouldn’t pay more for a 25-30% higher length of tenure than your competition? So keep swiveling but never lose sight of the lifetime value of your customers.